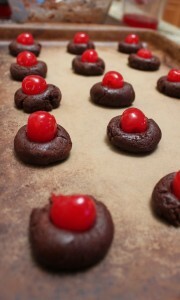 Chocolate covered cherry delight cookies are soft chocolate cookies with a sweet cherry filling. Reminiscent of cordial cherry candies, but without the gooey mess! Here we are nearly to the end of October (and Halloween next week—I’m not really ready for that yet!) and the 5th week of Christmas Treats. When it comes to chocolate covered cherries cordial candies (say that three times fast! ), it seems you’re either a fan or you’re not. 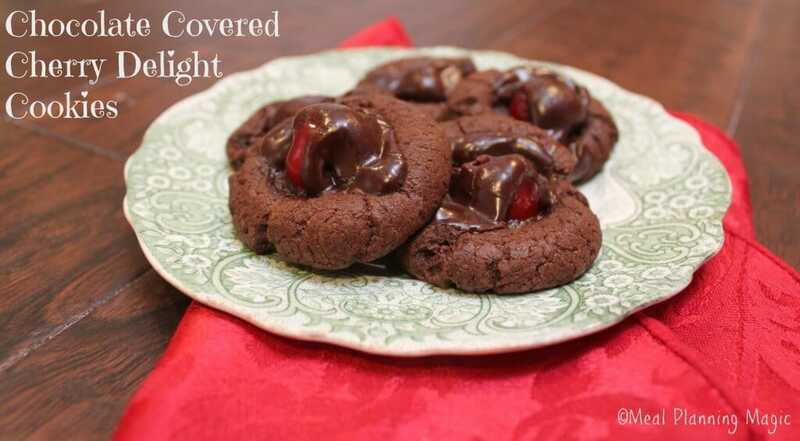 Well, I am and if you are too, you are going to LOVE these chocolate covered cherry delight cookies! I first discovered them while on vacation a couple of summers ago, after reading Chocolate Chip Cookie Murder, the first in a mystery series by Joann Fluke about bakery owner and accidental sleuth, Hannah Swensen. You see, Hannah is the owner of The Cookie Jar bakery in the fictional Minnesota town of Lake Eden. I love mysteries and especially cozies like these that also include a food theme! What’s really neat about Fluke’s books is that she includes recipes, too. She’s written so many books in the series that last year, she released a whole cookbook with all the recipes from her books, even including some never-before-published recipes! If you love food related mysteries like I do, I encourage you to check out this fun series. 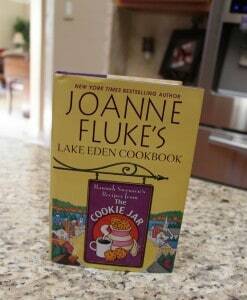 And be sure to check out the Lake Eden Cookbook too! 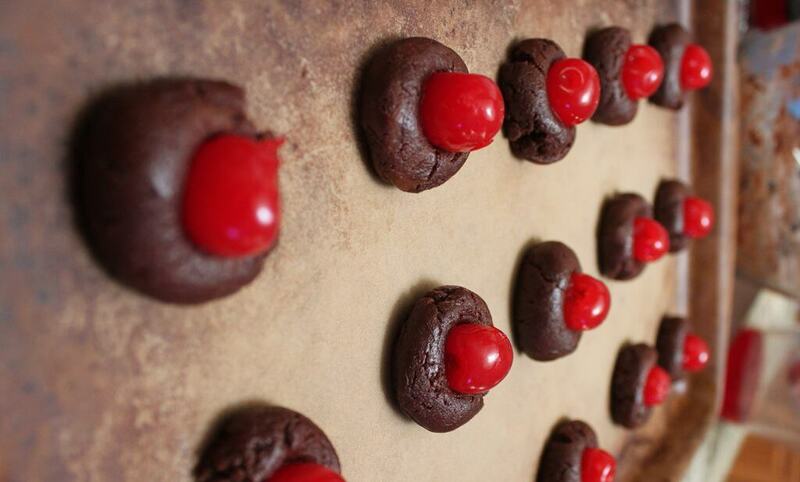 It wasn’t a month later that I tried these yummy little Chocolate Covered Cherry Delight Cookies, and now I’m excited to share the recipe with you. And don’t worry, they’re not nearly as drippy with that gooey filling as the cherry cordials, but the flavor still delivers. They’re soft and chewy with a hint of the cherries. This recipe is relatively simple and the cookies freeze well when packed in an air-tight container with wax paper in between layers. That is if they last that long—I dare you to eat just one! Melt the butter and mix in the sugar. Set aside to cool. After the mixture has cooled to a temperature that won’t cook the eggs, stir in the eggs and mix thoroughly. 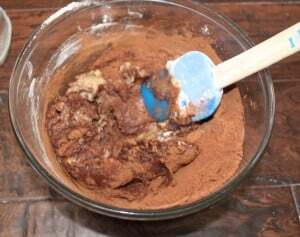 Add the baking powder, baking soda, salt, vanilla and cocoa, stirring after each addition. Add the flour and mix well. The dough will be stiff and a bit crumbly. Drain the cherries and reserve the juice (you will need some of the juice later). 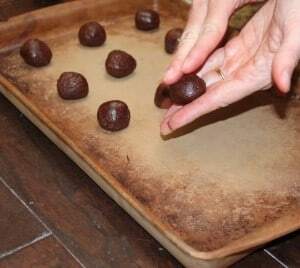 Roll the dough into walnut-sized balls and place on a greased cookie sheet, 12 per sheet. I like to use a scoop for this so they’re all evenly sized. Press down in the center of each ball to make a deep indentation. Place one cherry in each indentation. 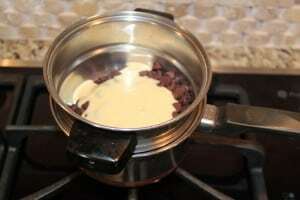 Combine the chocolate chips and the sweetened condensed milk in a microwave-safe bowl. Heat them on HIGH for 1 minute. Stir. If the chips are not melted, process on HIGH in 10minute increments until they can be stirred smooth. 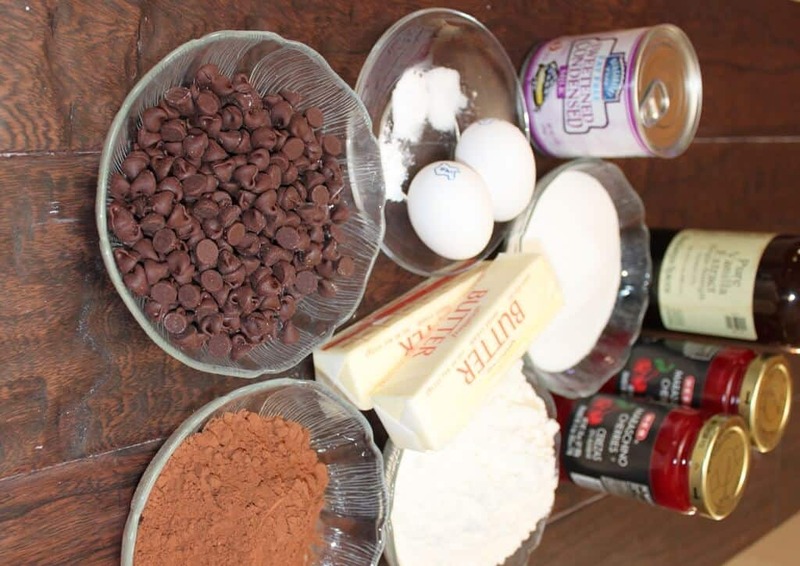 Add about 2 tablespoons of the reserved cherry juice to the melted chocolate mixture until the frosting is thick and will glob off a spoon. If it won’t glob off, keep adding juice until it is the right consistency. Spoon a small bit of the frosting over the center of each cookie – just enough to cover the cherry. It shouldn’t drip down the sides. Bake at 350°F in the preheated oven for 10 to 12 minutes. Let the cookies cool on the baking sheet for 2 minutes, and then remove to a wire rack to cool completely. Brenda’s Notes: This makes a pretty large batch but the recipe can be easily halved. [br][br]Hannah Swensen’s NOTES: If you don’t like cherries, you can substitute well-drained pineapple tidbits, using the juice for the frosting. You can also use pecan halves or macadamina nuts and thin the frosting with cold coffee or water. If you don’t have anything to go on top, just use the frosting because that’s good too! 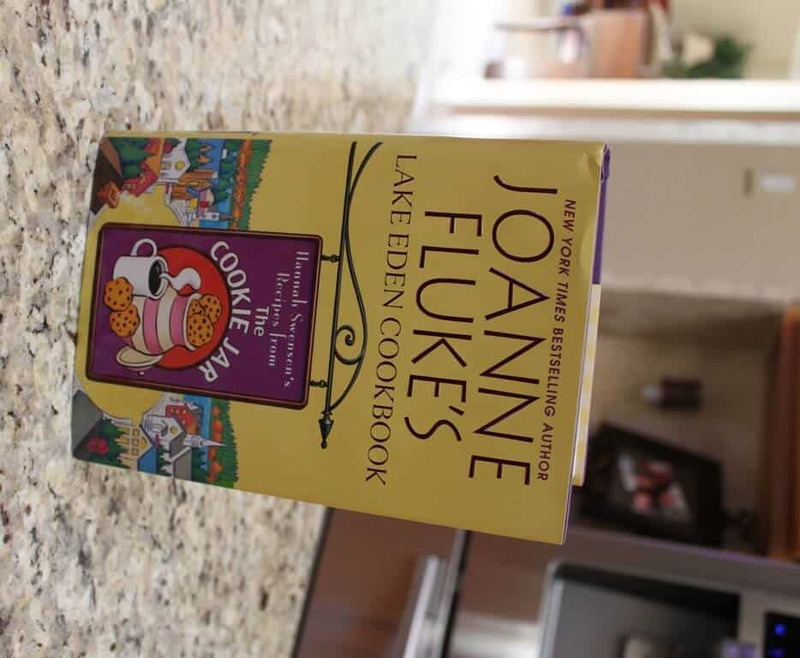 This book has all the recipes from Joanne Fluke’s fun Hannah Swensen mystery series! This dough is so easy to whip up–I didn’t even need to use my mixer! I ended up using my double boiler to melt the chocolate for the frosting. 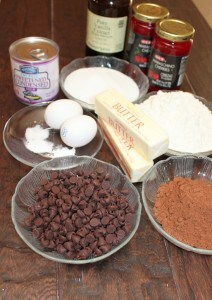 I use my 1 3/4″ (also one tablespoon) size scoop to make the cookies evenly shaped. 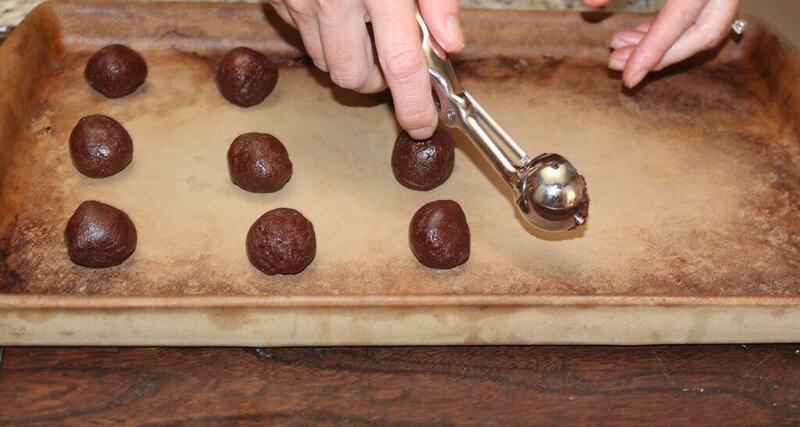 Rolling the balls of dough is easy when they’ve been preportioned. Don’t these look so yummy? The frosting should be thick but still kind of flow-y. 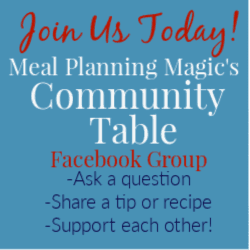 Be sure to check out all the other bloggers who are participating this week in the 12 Weeks of Christmas Treats blog hop… you’ll have no excuse of “I don’t know what to make!” And if you’re a blogger and want to join in on the fun, check out this post for the form to fill out to start baking along with us! It’s never too late if you’re willing to bake! The Hannah Swensen series is one of my absolute favorite cozy recipe mysteries! I remember these cookies – so glad you made them. Need to go through the books and make some of her cookies for the hop! Love these cookies – like a little bite of a black forest cake! 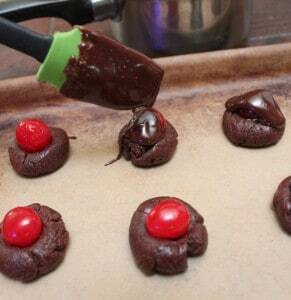 oh chocolate covered cherries are like a holiday tradition! This is a great idea! Perfect for my Grandpa. 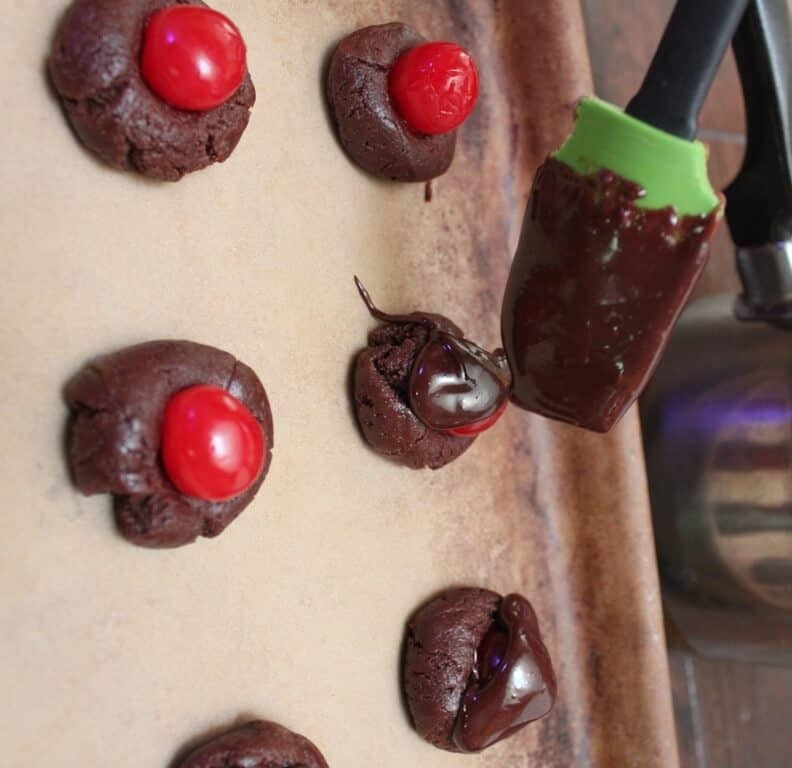 He always asks for a box of chocolate covered cherries…now I can just make him these! These look amazing!!! I have heard of those books are they good? I love a good mystery! I love the Hannah Swensen series–one of my favorites! And we’re big cherry cordial eaters in my house. My hubby, who doesn’t even like sweets, always expects a box of ’em in his stocking. But I’m thinking I’ll make these cookies this year instead–yum! Thanks for hosting!! I love books, movies, tv shows about food. Even if the main plot isn’t necessarily about food, I’ll flip back to the food portions and re-read/watch them. These cookies sound divine. I love the combination of cherry and chocolate (have you had chocolate covered dried bing cherries? If not, they will change your life!). The cookies look delicious. Chocolate and cherries can’t miss. These remind me of my favorite cookies! I’ve made a very similar recipe from BHG magazine. They are SOOOO good. I love the combination of cherry and chocolate.